Weekly Pokemon Broadcasting Station #089: "The Heavenly Legend, Hiroshi and Fire!" Pokémon Chronicles Episode 18: "The Search for the Legend"
While continuing his journey, the boat Hiroshi is on encounters a school of Gyarados. As the ship's captain wonders how to get past the behemoths, a silver haired trainer named Silver appears and sends the pokemon away with his Bohmander. Hiroshi is awestruck by the mysterious trainer, who reveals that he's on the way to Tomoshibi Mountain to battle with the legendary pokemon Fire. Silver wants to battle the pokemon to test his strength, and to do that he's enlisted the aid of two assistants. Hiroshi decides that he wants to see the pokemon as well, so he follows behind in secret. As the young trainer sneaks around, he discovers that the two guides who are traveling with Silver are actually Yamato and Kosaburou in disguise! They plan to capture Fire to give to Nanba-Hakase, but a sudden appearance by Silver cuts their communication with the professor short. 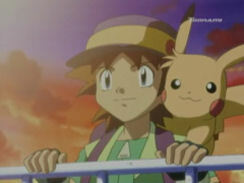 The four trainers eventually reach the top of the mountain and don't have long to wait before Fire appears before them. However, the pokemon seems to be unusually weak and isn't able to put up much of a fight Yamato and Kosaburou reveal their identities to Silver and explain that they chose to come along with the silver haired trainer in order to have him weaken the legendary pokemon for them. After a short battle, Fire is eventually caught in a net and plummets into the volcano, presumably to its death. However, the pokemon rises out of the inferno like a phoenix with a renewed strength that enables it to easily send the Rocket-Dan blasting off. Silver steps up to the pokemon and begins to battle it, but a sudden eruption of the volcano cuts their battle short. Silver is satisfied with his match, however, and decides to let the legendary pokemon fly away. Later, Silver tells Hiroshi that he'll stay on the island to await Fire's return and invites him to come back someday to battle him. As Hiroshi leaves on a ferry to his next destination, he remembers Silver's invitation and the exciting adventure he had with the legendary pokemon, Fire. So here we are at the last episode of Shuukan Pokemon Housoukyoku and the last made-for-Japan TV special. The rest of Chronicles will consist of random OVA's and a few Housou episodes that 4Kids skipped for whatever reason, but this one is essentially the last TV special before the era of PUSA's made-for-the-US specials. The Japanese producers end their series of Side Stories with a pretty decent entry. The scenes on the volcano stand out to me because of how rare it is to see this setting is in the Pokemon anime, and Silver is an intriguing character if only because he's one of the characters who I actually buy as being a feasible candidate for Satoshi's father. The animation for Fire's entrance is also really well done, and while the episode does end rather anticlimactically, it's still a fun ride while it lasts. The dubbed version is...surprisingly good, actually. I'm not a fan of Silver's dubbed voice at all, and there are some crappy rewrites here and there, but for the most part, this is one of the better episodes of Chronicles. And hey, 4Kids managed not to give Hiroshi any more pokemon he didn't have in the original version, so that's a plus. For your reference, this episode was released between episodes AG 095, "Huntail and Sakurabyss! The Evolution Riddle!" ("The Evolutionary War!") and AG 096, "A Muscle Battle!? A Double Battle!!" ("Training Wrecks"). 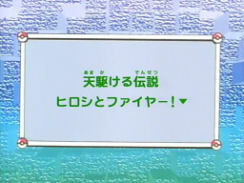 In the Japanese version, Marching March is used as the episode's ending theme. Bohmander, Chicorita, and Fire keep their Japanese voices. The Japanese music in this special is replaced by 4Kids' desultory music score, as usual. Narrator: "Continuing his long and challenging journey to become a Pokémon Master, Richie, along with his trusty Pikachu Sparky, sails onboard the S.S. Anne, bound for new adventures!" The Japanese version doesn't say anything about Hiroshi being on the S.S. Anne. 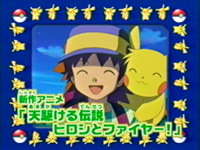 Originally, Hiroshi's narrating, and he just says that he's continuing his journey to become a Pokemon Master. The last line of the episode is also narrated by Hiroshi in the Japanese version, but 4Kids has the narrator do that as well. I don't think Mike Pollock had any other lines in the episode, so 4Kids essentially paid him to do this episode when they really didn't have to. 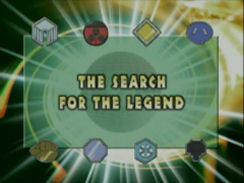 Also, a lot of people mistakenly type his episode's title as being "The Search for a Legend" when it's really "The Search for the Legend." The names Yamato and Kosaburou take for themselves in the Japanese version, Crete (クレタ) and Malta (マルタ), are come from two islands in the Mediterranean Sea. Their English names, Louise Armstrong and Satchmo, come from the famous jazz musician Louis Armstrong, who also went by the nickname Satchmo (satchel-mouth). Now I don't see how either version really makes sense since the nicknames really have nothing to do with them being professors, but whatever. Though I do have to protest the lameness that is "Bogus Fake Institute of Science." Not exactly 4Kids' best script writing work. The island Hiroshi goes to to see Fire is Tomoshibi Mountain, which is the mountain in Fire Red / Leaf Green where players can catch Fire. English players will know it as Mt. Ember, the mountain on Island One of the Sevii Islands. 4Kids didn't pick up on this and renamed it Mount Magma, and as a result many dub fans are missing out on the fact that the Sevii islands have been featured in the anime. Richie: "This reminds me of that time we got lost in the caves of Mt. Moon. You remember that, Sparky?" Hiroshi never mentions anything about some adventure in Mt. Moon; he originally tells himself how he wishes there was some sunlight or a campfire or something to guide his way off the mountain. A second is added to the shot where Yamato and Kosaburou first react to seeing Fire flying amongst the clouds. Pokédex: "Moltres. A one-of-a-kind legendary flame pokémon. So powerful, its fire dust can bring early spring to wintery lands." The Japanese version doesn't say anything about Fire being "one-of-a-kind." So if you find someone in a debate about legendary pokemon using this line from the dub as proof that there's only one Fire, kindly point out that this line was dub-only. In fact, the whole entry's different in the dub; in the Japanese version, Hiroshi's Pokemon Zukan talks about how it flaps its massive wings and is known as being a beautiful legendary pokemon. Cassidy: "Aw...poor thing's caught in a net!" Butch: "Hey, if we defeat and capture a legendary pokémon, does that make us legendary?" Butch's line is lame only because it brings back memories of the horrible "The Legend of Thunder" dub. 4Kids repeats the footage of Bohmander's Hyper Beam colliding with Fire's Flamethrower attack in the dub. In the original version, this scene is only shown once. You know what's weird about this episode? The dubbed version is actually longer than the Japanese version! So how did 4Kids go from making time cuts left and right to actually repeating footage to make the episode longer? 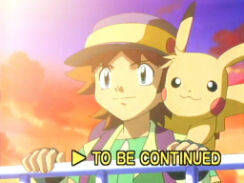 TO BE CONTINUED is wiped off the final scene of the episode.